The RD8100 locator provides automatic depth of buried cables, pipes and sondes and when the locator is correctly orientated above the target line or sonde. Current readings are also displayed simultaneously if the locator is orientated correctly (feature not available in sonde or passive frequency modes). Depth and current readings are automatically displayed simultaneously, but if the locator is not correctly orientated neither reading will be displayed. Depth range and accuracy vary depending on the makeup and type of target utility (e.g. cable, pipe or sonde), its depth and external environmental factors like electromagnetic noise, ground conditions and interference. WARNING: The accuracy of depth measurement is subject to a number of factors and is meant as a guide only. Never use the depth measurement to define mechanical digging depths. Always follow local safe digging guidelines. The depth measurement is to the center of the pipe, cable or sonde. The best readings are typically detected from ‘active’ signals output by a transmitter rather than from passive sources. The RD8100 locator is capable of determining cable depth when locating some passive power signals. However passive signals on lines are less suited for measuring depth because accuracy can be compromised by interference- e.g due to the passive signal being present on more than one line. WARNING! Do not make depth measurements near bends or tees in the line. Go at least 5m (16ft) from a bend for best accuracy. It is important to note that the RD8100 locator will only display depth and current (in applicable modes) when the locator is correctly orientated above the target line, cable or sonde. To ensure the locator is correctly orientated, use the Compass feature. When locating lines, make sure the Compass display is in the North / South orientation position. When locating sondes, make sure the Compass display is in the East / West orientation. To minimize signal distortion, do not apply the signal by induction. 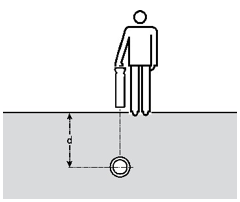 If Direct Connection or signal clamping is not possible, place the transmitter in induction at least 15m (50ft) from the point of any depth measurements. Depth measurements may not be accurate if there is audible interference or if part of the transmitter signal has coupled to a nearby line. Confirming the Peak position coincides with a Null position indicates that the position is suitable for making a depth estimate. Pinpoint the target line accurately with the locator. Check the locator is directly over the line, the antennas are at right angles to it and the locator is vertical. Adjust the sensitivity level to bring the bar graph indication to approximately 50%. If the ground appears to radiate a strong field, perhaps near a radio station, check depth by holding the bottom of the antenna 50mm (2”) above the ground and subtract this reading from the indicated depth. Check a suspect or critical depth reading by lifting the locator 50mm (2”) above the ground and repeating the measurement. If the measured depth increases by the same amount it is a good indication that the depth reading is correct. Check that the route of the line is straight for at least 2 meters (6 ft) to either side of the measurement point. Check that the signal response is reasonably constant over the 15 meter distance to the transmitter and make depth measurements to either side of the original point. Check that there are no adjacent lines carrying a significant signal within 1 to 2 meters (3 to 6 ft) of the target line. This is the most common source of error of depth measurements as a strong signal coupled to an adjacent line can often introduce ± 50% error. Make several depth measurements at points slightly displaced from the line’s apparent position. The shallowest indication will be the most accurate and will also indicate the line’s position most accurately. This paragraph describes several quick and easy ways of verifying that the depth reading on the locator when used for markers or conductors and sondes is within acceptable limits. Refer to this if you are getting inaccurate depth readings from a cable or pipe for which you know the approximate depth. Inaccurate depth readings could be the result of the locator picking up a stronger signal such as another cable or pipe running in close parallel to the target pipe or cable. Place the transmitter on top of a non-metallic object, 18” / 500mm in height or more, on the ground and away from any buried lines. Switch the transmitter on in induction mode. Hold the locator with the blade horizontal and pointing towards the front of the transmitter and approximately five meters from the front of the transmitter. Select the same frequency as is selected on the transmitter but make sure that this frequency is in the sonde mode. Move the locator from left to right and when the bargraph reading is at its Peak note the depth as indicated on the locator. Measure the distance from the base of the locator to the center of the transmitter using a tape measure. Compare this reading with the depth reading on the locator. The locator can be considered accurate if the difference between the depth reading on the locator and the distance measured with the tape is less than 10%. Apply a signal to a cable or pipe of known depth. Locate the cable or pipe; the locator will display depth on the LCD automatically. Compare the depth reading on the locator with the actual depth. NOTE: The accuracy of depth measurement is subject to a number of factors and is meant as a guide only. Exercise caution when performing any excavation.